There was a time I really enjoyed grocery shopping. Not so much anymore... probably because it has become a necessary evil that I need to fit in weekly, preferably without munchkins. It has turned into a mission, and for me the success of it is completely dependent on my efficient and effective grocery list! To help, I have used this ALL OUT OF list pad for several years and it works well. It has a magnet on the back so perfect to place on your fridge. It's manufactured by Knock Knock, and you can find it at any major book retailer. 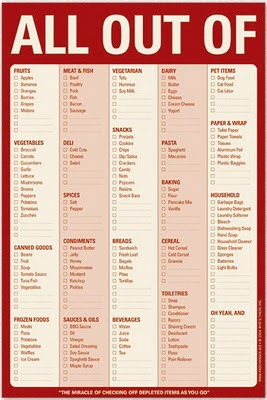 1) Organize your list in sections according to your grocery store - dairy, produce, baking, frozen, canned goods, etc. (This is why I really like the ALL OUT OF pad). This really helps you not forget anything as well as not running around the store like a chicken with it's head cut off. 2) Keep your list accessible. I keep mine on my fridge. I can easily jot something down when I think of it, or if I come across a recipe that calls for something I don't have, I mark it down. 3) If I do a meal plan for the week, or am having a food gathering, I will use the back side of the list to mark out each day and what I'm making. Then the list AND the meal plan are together. This is helpful if you are shopping and one of your items is not in stock. You can flip over your page and see if it will effect what you were planning on make and adjust on the fly accordingly. 4) If you run out of something be sure to mark it on the list. Get your family involved and have them do the same. If my husband uses the last of the peanut butter, he now knows to mark it on the list. 5) There have been times when I need to make a few stops to get all groceries based on selection. For example some items I need to go to Costco, some SuperStore, some Walmart or maybe even a specialty store. If this happens, I simply color code the list by using a highlighter. Yellow for Coscto, Pink for SuperStore, etc. 6) Coupons. I'm not a big coupon person, but if I do have one that I want to use, it goes on the fridge with a magnet beside my list so I don't forget it! 7) Lastly, I cross items off my list as I put them in my cart. Once home, if there were items I didn't pick up, I transfer them to the new list on my fridge for next week. Happy shopping. Urg! ...and don't forget to use your recyclable grocery bags. That is a really good idea! I have never seen a list like that before. Grocery shopping is a chore and the better organized, the better. Thanks for discussing this important topic. I definitely need help getting organized so thank you for the tips!! Tonight I happened to spot this at Chapters so it is now on my fridge as I type. Grocery shopping needs to be as quick and efficient as possible so these tips are very helpful! Thank you! I have that list-pad on my fridge. As soon as I run out of something (chuck the empty container in the garbage) I check it off on the list! I also put it next to my "What To Eat" pad, also from Knock Knock. I make my meal plan for the week, then put the groceries I need on my "All out of List" It's a great system! Great tips! I really do love your "All out of" list. This is a great idea. I usually jot it on paper, but your way is wonderful in getting everyone involved! Try grocery shopping once a month! It makes that necessary evil a little less stressful and time consuming! With the holiday season fast approaching, more department stores discount than ever are starting to run special holiday sales for the upcoming Christmas season. Even when the holiday shopping season seems to still be weeks away, stores of all types are still preparing for this important season.